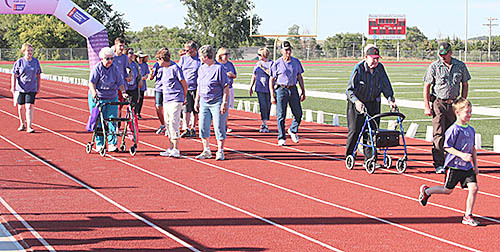 About 30 cancer survivors walked the first lap to open the annual Boone County Relay for Life Sunday evening, June 25, on the Boone Central track. More than 100 people were on hand to continue the battle against cancer at the 2017 Boone County Relay for Life last Sunday, June 25, at the Boone Central High School track. 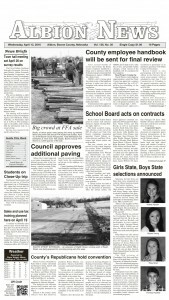 They again celebrated a “Sunday Fun Day” with music and games combined with the laps around the track from 4 to 10 p.m. Opening ceremonies were held at 6 p.m. with Presentation of the Colors by Albion Boy Scouts, and singing of the National Anthem by Madysen Zoucha. Mike Thiem served as master of ceremonies. About 20 area cancer survivors were featured during the opening “Survivors’ Lap” on the track..
A luminaria ceremony was held at 9 p.m. to honor the memories of those who have lost the fight against cancer. Closing ceremonies began at 9:45.